Visit our website now to see pictures and info for all available puppies. All of our puppies are registered, small, cute, healthy, and playful and come with health guaranty, free vet check and a complete puppy package. For more information or questions that are not answered in the FAQ, Please feel free to call during business hours. Our private kennel / nursery is located at Las Vegas, NV 89102 - Give us a call or send an email to set up a time for a visit. We are open Sunday through Friday and closed on Saturday. Don’t forget to check out our gallery page to see some of our celebrity costumers like Britney Spears, Will Smith, Leonardo Dicaprio, Miley Cyrus, Chris Brown, Bob Saget,Stacy Dash, Christine Divine (Fox News), Adrienne Maloof ,Lil’ Kim, Pepe Aguilar and the puppies they got. 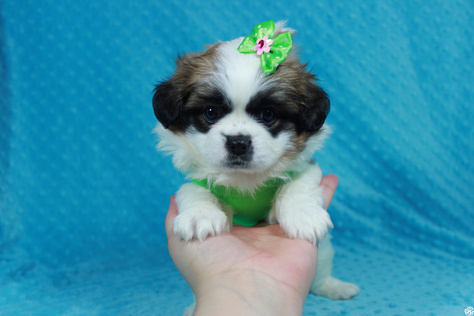 Also Available: Tiny Teacup & Toy Yorkie (Yorkshire Terrier), Maltese, Maltipoo (Maltese & Poodle), Morkie (Maltese & Yorkie), Shih-Tzu, Malshi (Maltese & Shih-Tzu) and English Bulldog.